Will Trump Halt Climate Change Through Solar Geoengineering? Scientists are in the midst of devising real-world schemes to inject 250,000 metric tons of sulfate particles into the atmosphere in an effort to reverse climate change. The idea has been around since the 1960s and has recently become a cultish policy favorite of prominent Republicans such as Newt Gingrich, Rex Tillerson and even President Donald Trump. Known as solar radiation management (SRM), the process entails artificially creating cloud cover which would block enough of the sun’s rays to prevent further increases in the Earth’s temperature. Evidence suggests that SRM could actually be capable of cooling the planet, and many consider it to be a last-resort, quick-fix option if the ramifications of climate change continue to worsen. A team of researchers and scientists at Harvard University have earmarked $20 million to see the project to fruition, with initial tests outside a lab environment coming as soon as 2022. Leaders of the Harvard project estimate that for $10 billion, Earth could effectively be surrounded with a solar shield, armoring the planet with the atmospheric forces it needs to undo some of the damage done to the environment in the last several centuries. This procedure of “planet hacking” is but one method of solar geoengineering that is quickly gaining steam in powerful Washington circles. So is saving the planet really a Trump agenda item, and is it feasible at all? Due to ozone layer depletion, the spewing of harmful carbon emissions, over-population and the exhaustion of natural resources, the Earth is warming by considerable measures each year. NASA data shows the hottest year on record was 2016, and before that it was 2015, and before that it was—you guessed it—2014. Each full revolution around the sun corresponds to a rise in global temperatures, with 2016 a full 1.78 degrees Fahrenheit warmer than the 20th century mean. Suffice to say, moving a large portion of the Earth’s population over to cleaner, more sustainable energy sources has been a priority for several decades. However, the problem of global warming cannot be solved solely by installing massive utility-scale solar arrays, or constructing wind farms, or reinvesting in nuclear power generation. That’s why scientists have devised a way to pump tiny sulphate particles into the air, which would result in blocking a fraction of the sun’s harsh rays around the world and reflecting them back into space. The process would comprise a continuous and monitored output of aerosols that are similar to the chemicals released from volcanic eruptions. In time, a shield of particles would blanket the atmosphere and only allow a smaller, less-intensive portion of sunlight (it is unnoticeable to the human eye) to reach the Earth’s surface. By managing the sun’s output, the Earth’s temperature would no longer increase and even begin to cool, reversing centuries of warming. Experiments are currently being run in a laboratory using small quantities of the sulphate. The next steps will involve replicating the experiment externally using a limestone compound before official implementation occurs in 2022. Just How Risky Is It to Redesign the World? Though solar geoengineering of this kind seems like something out of a bygone sci-fi flick, there are definite real-world implications to tinkering with a planet at such a scale. For instance, the hope would be that geoengineering would benefit everyone equally, but as keen observers suggest, that would hardly be the case if implemented. Not to mention, there is simply no true way to know exactly what might occur if such a technology were unleashed, despite all its fine-tuning. Some scientists believe an all-or-nothing solution such as this would disproportionately impact drought-prone regions of the world such as Africa. Using science to manufacture a new atmosphere would mean impacting weather patterns, crop production, food availability and the trillions of organisms and ecosystems that occupy Earth. Unintended consequences could include calamitous and abrupt adjustments to climate cycles, the spread of disease and even war, according to the UN’s intergovernmental panel on climate change. Historical incidences of drastic climate alterations paint a bleak picture as well: In 1815, the eruption of Mount Tambora in present-day Indonesia resulted in The Year Without Summer—an eruption so large it caused global cooling, extreme crop failures and widespread famine throughout the northern hemisphere, in addition to completely devastating vegetation on the island of Sumbawa, the location of the volcano. In spite of these downsides, Harvard and its backers believe they can strategically mitigate risks while pushing forward with their planet-saving agenda. At the moment, Trump may be on board. Solar geoengineering isn’t considered junk science in 2017. Though it appears to be on the fringe of actual study, the project has the backing (and funding) of Bill Gates, members of the EPA and various environmental and space associations. For Trump and many Republicans, solar geoengineering is an avenue to act on climate change without admitting it is caused by man or, more specifically, fossil fuels. Moreover, the process of injecting sulphates into the atmosphere does not also require governments and businesses to limit their use of fossil fuels. Environmental activists view this method as a bait-and-switch: Coal companies still reign supreme and pollute the air, while Trump makes promises of solving climate change. 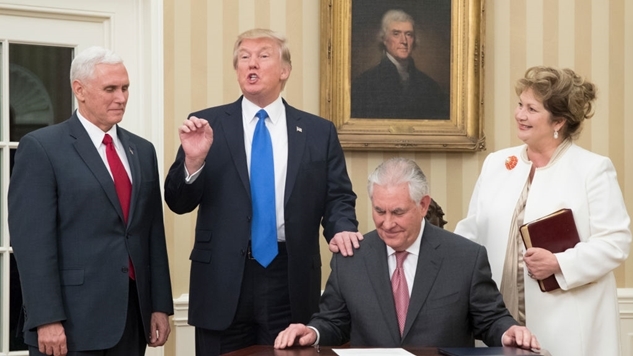 And for former ExxonMobil CEO Rex Tillerson, as well as Trump’s close contacts with oil-rich Russia, that probably sounds like a great deal indeed. Trump surrogate Newt Gingrich fondly opined the plan was a way to “stop the green pig,” meaning that geoengineering could supplant genuine action on green energy initiatives, and instead allow existing energy infrastructure (oil and gas companies) to solve the problem of climate change. Herein lies what’s truly in it for Trump and the Republican Party—a way to line the pockets of corporations that already contribute to global warming and continue to do so for decades to come. So will it ever come to pass? Will the U.S. or the UN authorize such a planetary strategy, and will they also accommodate the voices of those who may be impacted the most? The hope is that hacking the Earth will not be required, and that stronger efforts to combat climate change will continue to take hold and show positive results. But for now, Trump certainly seems intrigued by the idea of dramatic action that goes against the grain, and that could very well equate to a fundamental shift in how we address global problems.